The emergence of an increasing number of foreign students in Russian universities indicates the importance of the Russian higher education system in the world community. At the same time, a new problem emerged on the agenda — how to train foreigners from abroad with high quality, taking into account their different readiness in mastering the Russian language and different subject training. The article describes the problems that foreign students face when studying informatics at a pedagogical university. The combined profiles, including “Informatics”, of the Faculty of Physics and Mathematics of Mordovian State Pedagogical Institute named after M. E. Evsevjev were the experimental research site. On the example of the “Theoretical Foundations of Informatics” discipline, the ways of teaching informatics are shown. Examples of assignments, including tasks for independent work, for teaching foreign students to informatics at the specified university are given. Keywords: pedagogical university, informatics, foreign students, training, teaching. The second decade of the 21st century is characterized throughout the world by keen interest of general public in school informatics courses. It is due both to natural interest of children in everything digital in context of modern world, position of parents who believe that informatics has huge importance for the future career of their children, and to pressure of professional associations, businesses, universities concerned about status and content of school informatics courses. The research discusses the historical aspects of formation and development of the national school informatics course, modern approaches to the formulation of its purposes and the selection of content. The purpose of the research is to identify and compare the main trends in the development of school informatics in Russia and in the world, to determine on this basis the possibilities of developing the methodical system of teaching informatics. The results of the research led to the conclusion that Russia has been and still remain one of the world leaders in the field of general education in informatics: in our schools since 1985 to the present day there has been compulsory study of informatics, and the fundamental component occupies an important place in the content of the informatics course. Three key trends in the development of school informatics abroad have been identified: strengthening of fundamentality, compulsory, continuity. It is revealed that abroad priority attention is paid to the use of potential of informatics for the development and formation of computational (computer) thinking of younger schoolchildren. Introduction of compulsory informatics education in the early stages of general education is defined as a strategic direction for the development of Russian school informatics course. Keywords: school informatics, general informatics course, training in informatics. Sirazetdinov R. T., Fadeev A. Yu., Hisamutdinov R. E.
The article describes the use of the anthropomorphic robot ROMA in the educational process. The trends and the main threats associated with the avalanche-like development of robotics and total robotization of society, and the tasks that the teachers face are considered. A small robot ROMA developed at the Kazan Federal University is presented, and its characteristics are described. A comparison is made with the characteristics of foreign analogues, whence it is clear that the presented robot occupies a worthy place in its niche. Various variants for using the ROMA robot in the educational process — from primary school classes to senior university students, are considered. There are educational disciplines and specific topics on which the use of the robot can give a significant impetus to understanding and mastering the subject. On the one hand, this is connected with the students’ interest in the robot as such, and on the other hand, the robot allows to physically demonstrate certain abstract concepts, the effect of algorithm execution, etc. The robot can be used at school for technology lessons. It may be indispensable when studying programming at various levels, 3D modeling, the theory of automatic control, elements of artificial intelligence, pattern recognition, and in a number of other courses. Currently, the process of developing methodological support for various disciplines is underway. Keywords: robotics, anthropomorphic robot, informatization, education, innovative technique, android robot. 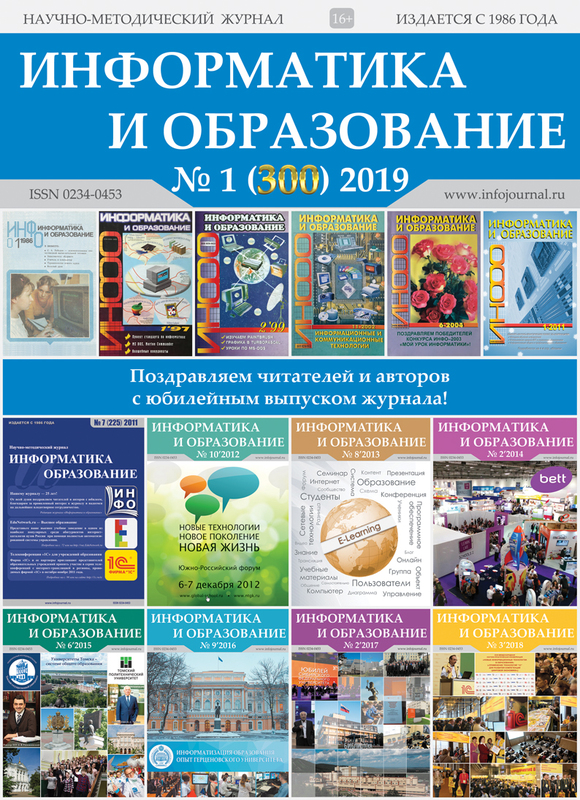 Andryushkova O. V., Grigoriev S. G.
This article is a logical continuation of the material published in the journal “Informatics and Education” № 6-2018. The authors consider the issues of predicting learning outcomes based on the calculation of negentropy, which is proposed to be considered as an integral information indicator characterizing the quality of student learning. The work can be divided into three stages and is based on the construction of the hierarchical structure of the criteria-based quality system. At the first stage, a questionnaire was developed for the survey of expert teachers, in which it was necessary to note, from the point of view of importance, the criteria of the first and second levels those influence the process of emergent learning. At the second stage, using an expert rationing method, an array of expert estimates was processed, representing an example of a fuzzy set. As a result, weighting coefficients were obtained according to the criteria of the first and second levels. At the third stage, a dichotomous assessment of the third level criteria was carried out and the integrated values of negentropy were calculated for the three directions of training and for the model situation. The algorithms proposed in the article can be used both to assess the quality of already developed online courses, products or educational processes with their use, and to predict learning outcomes based on expert assessment. Keywords: emergent learning, e-learning, blended learning, criterion weight, fuzzy set, predicting learning outcomes, quality of learning, negentropy. In this article, possible ways of use of computers for the teaching of advanced sections of mathematics that traditionally belong to undergraduate curricula, namely elements of calculus, number theory and abstract algebra are considered. Use of computer technologies can help also to implement such approaches as genetic method and the use of various modes of representation in education. According to cultural-historical theory of L. S. Vygotsky, computer technologies can be considered as the tool for the construction of concepts in the process of learning. The most appropriate for teaching advanced mathematics are such computer algebra systems as Maple, Mathematica, and various systems of dynamic geometry. We will consider the possibilities of Geogebra for the work with functions at the initial stages of undergraduate calculus courses, namely for the work with concepts of limits and derivatives of functions. Keywords: information technologies, computer algebra systems, Geogebra, algebra, number theory, calculus. The article presents an analysis of the influence of modern digital technologies on the content of new master’s programs of pedagogical education for the preparation of technology teachers. Currently, the development of modern industrial technologies in the world occurs in the paradigm of Industry 4.0, which highlights such fundamental technological directions as robotics, modeling, big data, industrial Internet of things, cloud computing, additive technologies, augmented reality, etc. These areas need to be included in the content of technological education at school, and this, in turn, requires highly qualified teachers who also know the basics of the technologies under consideration and are able to form pupils’ competences in the field of modern digital technologies. One of the opportunities to get the teacher competence in the field of modern technologies, including digital technologies, is training in the magistracy. Master’s programs can more quickly respond to changes in educational markets, including new content and new educational technologies. The article analyzes more than 30 programs of Russian universities, in the disciplines of which such modern industrial technologies as robotics, Internet of things, 3D modeling, big data, cloud computing, virtual and augmented reality, computer modeling, etc. are presented. Keywords: digital technologies, Industry 4.0, magistracy, technological education, e-learning.